An Acronym: Who do you think you are? Popular series of reality TV programs in which teams of experts help celebrities trace some of their family lines. A criticism of all the programs is that they make the research process appear easy. The UK version first aired in 2004 and is now in its 11th season. The Australian version which is into its 6th season first aired in 2008 with Jack Thompson being the first celebrity featured. The US version was first aired in 2010. This evening the Geneadictionary is one week old.. I am thrilled with the response I have had from the geneablogging community. There have been encouraing comments on the blog, the URL has been shared on Facebook, Twitter and Google+ by my geneablogging friends and the blog has received mentions on two “Best of the week” type lists. Several folk have signed up to follow the blog. Thanks to all of you for your support. What has been absolutely delightful is the collection of geneawords that people have suggested for the dictionary, here I must single out my mate, Pauleen Cass, a human geneadictionary, who has suggested a raft of words for inclusion. I added around 15 more words yesterday and have more to add. I am tempted to create and post entries for all of the Geneadictionary words immediately but I am trying to restrain myself lest I flood the blogisphere or run out of content. Please take a look at the Geneadictionary and AKAs pages and let me know of any additions or please share any information you may have about the history of the words there. Between 16 and 38 visitors have visited the site each day (can’t find a total) and they have made a total of 479 page views. I think that’s pretty healthy for an infant blog and am rather chuffed. 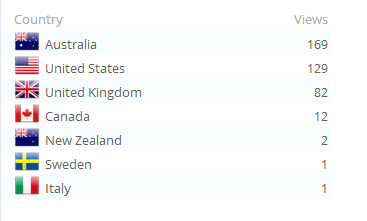 As would be expected most of the visitors are from English speaking countries with Australia just nudging out the United States for most page views. A special g’day goes to the visitors from Italy and Sweden. Can you tell thatI am enjoying the way that WordPress displays statistics which is so different from what i am used to with Blogger. BTW most visitors came via Google+, my favourite social media site for genealogy, followed by Facebook,Twitter, Geneabloggers and GeniAus. Suggested by Pauleen Cass in a Google+ comment on 12 August 2014. A genea-journey could describe a journey to research your family history and discover new relatives and information about them, or it could be an actual physical trip to the places your ancestors lived. Whether it is a journey confined to books, archives, online websites or family interviews, or a journey “home,” the goal is the same: Learning more about your family. 2. Geneajourney is the title of a family website by an unnamed person. 3. Geneajourneys is the title of a genealogy blog written by Patricia (Pat) Desmond Biallas. As we travel through time I wonder if any of our Geneadictionary words will make it into the Oxford Dictionary. I was interested to see in a blog post from Oxford this week how words are selected. This cool video narrated by a person with a delightful Scottish brogue explained the process . As I believe that blogging is a two-way street I appreciate comments on my blog posts. At the moment I have my WordPress L plates on and can’t quite work out the security settings for commenting. Please bear with me as I try to get my head around this feature. While I want to deter spammers I also want to make it an easy process for my genimates to have a say. The PIP Process. Persistence, Inventiveness and Patience.Persistence – keep at it, try, try and try again. Inventiveness – harness your creative powers, think laterally to find your way around a problem. Patience – just like Snow White believed that “one day my prince will come” believe that some day you will find your answer, it make take two, ten or twenty years to find that magic sledgehammer. Hey – I just invented the PIP process – my bit of creativity for National Family History Month.